Vaal Streams is indeed one of the best Vaal River venues for your week-end get-away, holiday, camp, picnic, Team Building event, conference or function - any time of the year! 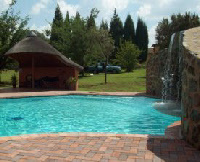 Our private and versatile resort is located in a beautiful nature setting on the Vaal River, just a few kilometers below the Vaal Dam between Deneysville and Vereeniging (off the R716 road) - about 20 minutes from Vereeniging, about 25 minutes from Emerald Casino and an hour's drive from Johannesburg. 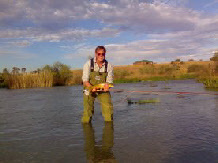 Note that we are on the Vaal River. 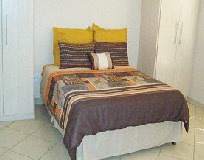 A fully furnished and fitted self-catering four bedroom Main House with DSTV, 'River Lodge' can comfortably accommodate three couples (double beds) and six children/ adults in single beds (12 guests in total). Provision can be made for extra guests and beds by arrangement. Huge bathroom - bath, basin, shower and toilet - plus separate guest toilet. Fully fitted modern kitchen with granite tops, glass-top stove, oven, microwave, toaster, double door fridge, crockery, cooking and eating utensils. 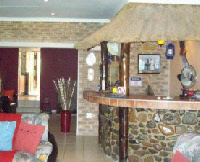 Lounge with thatch built-in bar. Large verandah provides under roof entertainment in case of inclement weather. 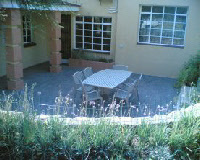 Lapa with built-in braai and adjacent. Boma with firepit to seat 60 plus visitors. Grootbek Geelvis and Kleinbek Geelvis are identical and each comprises of a fully furnished and fitted self-catering luxury Cottage with 1.5 bedrooms which can suitably accommodate 1 couple in a queen size bed plus 3 children/single adults in comfortable innerspring mattress single bunk beds. Fully fitted modern kitchen with granite tops, stove, oven, kettle, toaster, microwave and fridge, crockery, cooking and eating utensils. Lounge with two fold-down sleeper couches for 2 extra guests by arrangement. Tiled floors with under floor heating. Flat screen and DSTV decoder. Large verandah provides under roof entertainment in case of inclement weather with built-in braai. A rustic fully furnished and fitted self-catering Dormitory, Fish Eagle can comfortably accommodate from 5 minimum up to 50 guests in total. This provides ideal competitively priced accommodation for small and large groups alike which is functionally furnished with comfortable quality innerspring bunk beds. Fully fitted functional kitchen with stove, oven, microwave, kettle, urn, toaster, fridge and freezer. Tiled ablutions with separate men's and ladies showers, toilets and basins. Separate wheelchair-friendly facilities for men's and ladies. Large thatch Lapa provides under roof entertainment in case of inclement weather, complete with two built-in braais, gas cooker, tables and chairs for 50 guests. 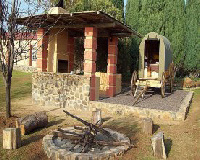 Seeking new frontiers and crossing over the Vaal River during the Voortrekker era in the 1800"s, the pioneers made use of sturdy ox wagons for their main transport mode and accommodation means. Turning back the clock, Vaal Streams Guests can now share a bit of that same nostalgy. 'Fyndraai', 'Noordsicht', 'Vinkel' and 'Koljander', four full-sized Ox Wagons were specially commissioned to each provide warm and cozy accommodation for one couple in a comfortable queen size bed suite. Positioned in beautiful gardens with Vaal River views, this is a unique opportunity providing guests with basic facilities to maintain and ensure that authentic Voortrekker and pioneer atmosphere. Guests in Ox Wagon accommodation make use of the neat tiled ablution facilities with separate men's and ladies showers, toilets and basins. Separate wheelchair-friendly facilities are available for men's and ladies. A Pergola provides basic shade and shelter, complete with lighting and plug points, built-in braai, gas cooker, seating, counter top for food preparation and prep bowl. 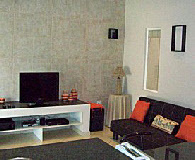 The unit comes fully fitted with kettle, toaster, microwave, crockery, cooking and eating utensils. There are refrigeration facilities. 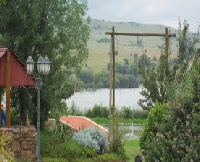 In addition to several self-catering accommodation options we also host a variety of exciting and fun Team Building activities, including River Rafting, archery and target shooting as some of our main events. • Indoor or outdoor Target Shooting - special discounted rates available to guests. • Walks or day hiking - various circular routes to suit energy levels - durations from 1-4 hours or more. • Cycle routes - bicycles for hire. • Mountain biking – bring own bikes. If there is anything else we can assist you with please don't hesitate to contact us.